Grain de Musc turns six today! Not a bad time to take stock. Or rather, to turn back to the fragrances that have stuck: the ones I’d be wearing if I weren’t constantly testing new stuff – a lovely problem to have, but nevertheless quite an annoying one… So here it is: my personal hall of fame. I’m just listing the ones I own full bottles of – and, again, only the ones I regret not having more time for. With a couple of exceptions, I’ve left out discontinued vintage or irretrievably reformulated classics (like Vent Vert). I've included the links, so if you want to go back on some of my write-ups over these six years, click away! Frédéric Malle follows closely with six: Le Parfum de Thérèse, Carnal Flower, Une Fleur de Cassie, Musc Ravageur, Dans tes bras and a newcomer, Eau de Magnolia. Guerlain, obviously, with five picks: Mitsouko (still my all-time favorite, especially in its current extrait version), Vol de Nuit (ditto), Jicky (vintage), Attrape-Cœur/ Guet-Apens/ Vol de Nuit Évasion and Sous le Vent. Annick Goutal lines up four: Songes, Mon Parfum Chéri, Grand Amour and Eau du Sud. Cartier tallies up four as well, with: La Panthère, La Treizième Heure, L’Heure Fougueuse and L’Heure Mystérieuse. L’Artisan Parfumeur yields three with (duh) Séville à l’aube, La Traversée du Bosphore and Nuit de Tubéreuse. Serge Lutens, surprisingly, tallies up only three, perhaps because his was the first niche brand I adopted and other loves have crowded out his line-up: Bois de Violette, La Myrrhe and Boxeuses. Hermès is another brand I admire, though ultimately I’ve truly connected with only one JCE, Eau deNarcisse Bleu. The two others are the classic Eau d’Orange Verte and Bel Ami. Parfum d’Empire also lines up three: Azemour, Aziyadé and Cuir Ottoman. Patou comes in with two picks, Eau de Patou and 1000, as does Rochas with Femme (vintage) and Eau de Rochas. I didn’t do it on purpose, but the list yields a nice round 50. I’m too lazy to look up launch dates, but out of those 50, I can count only a dozen pre-1990s fragrances, so it turns out I’m not that much of a vintage girl (maybe because most bottles live in the refrigerator). There aren’t more than a dozen either that came out in the mainstream, so: definitely niche and exclusives, from fairly classic houses. As far as genres go, chypres pretty much dominate the selection with a least twenty picks. But I’m surprised to find six colognes since I never thought of myself as a citrus lover (though most of those can come under “chypres”). About ten fragrances rate as “white florals”, and as many have leather notes. Orientals are scarcer, gourmands practically absent. So there you go. With chypres in the middle, branching out on one side into white florals via fruity/lactonic notes, and on the other with leathers via their darker, woody-mossy tones, it’s as good a way as any to draw a personal scent map. What about you? Have you ever listed your “standards” to find out where you stand on the map? I was thrilled to see that you have listed so many of my favourites and feel that we could almost be scent twins (I was already wearing Mito this morning). Here's to many more Grain de Musc birthdays! Thank you Jillie! It's lovely to find a scent twin, isn't it? Dear Denyse, a very happy sixth - I hope you're wearing your favourite chypre and drinking champagne, and like Jillie I hope to toast to many more GdM anniversaries. I love the approach of just writing down ALL of your favourites rather than having to narrow it down to a top 10, that also means that although my scent map does look rather different - there are still some overlaps, like vintage Femme and Attrape-Coeur amongst others. Thank you! In fact, I celebrated by attending a baroque music concert at the chapel of the Château de Versailles (where the accoustics are so terrible it all came out a mishmash, sadly), with champagne at the cocktail later and... Chanel 1932, which I'd shown my students today. Not quite a chypre, but perfect (my concert companion, a fellow perfume *and* baroque music connoisseur, thought so too). What a shame about the acoustics with such an otherwise perfect setting. Chapels are often a problem like that. Other than that it sounds like you couldn't have had a better celebration. It was a selection from musics played in Venice during the Baroque era -- but from the different communities and cultures that came through rather than the famous composers. The ensemble is called Baroque Nomade. Happy 6th birthday, and many more to come! I could live happily wearing only the fragrances on your list. I'm sure between us we could rake up a cool hundred though! Happy Anniversary! I have only had the pleasure of smelling two perfumes on this list and you sent me a sample of one of them! The lovely Seville a L'Aube and one of my all time favorites, Bvlgari Black. I shared the SAL with my favorite perfume sales person at Nordstrom, who never gets to smell any niche, he found it as sublime as I! I am still saving for a whole bottle. Congratulations and happy anniversary! What a wonderful scent compilation -- I was nodding my head to so many of them as I went down the list. Thanks for sharing! 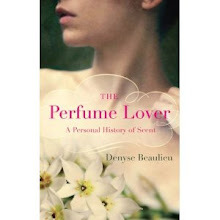 Huge congratulations, Denyse, and huge thanks for your insightful reviews, for The Perfume Lover and, especially, for Séville à l'aube. I haven't made a list, but it would overlap a lot with yours (at least in part due to your tempting reviews!). I have fewer Chanels. For the brands on your list of singletons, I'd have Manoumalia but swap everything else for Amouage, By Kilian, Diptyque, a Jil Sander and some others. My favs would include more pre-1990, too. I stuck to stuff I had in full bottles, otherwise I could think of a few Kilians I'd love to spend more time with, and I've long hankered for a bottle of Jubilation 25, but with the amount of stuff I've got it's just unreasonable to go on adding the bottles. I'm running out of space, not to mention skin! Happy Anniversary, dear Grain de Musc ! 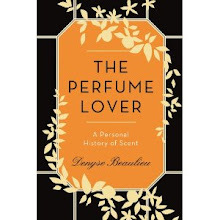 I only read you since two and a half years, since, let's say, my perfume hobby expanded - since I discovered niche and perfume blogs. Thank you for the valuable information you share with us, the instructive and highly cultivated articles. I fully appreciate your Hall of Fame, I found a few items that belong to my own Hall of Fame, too... Full bottles or not. I wish many many Happy Returns oft The Day. Thank you Gentiana, I'm happy to have inspired you to explore! Thank you Kate, I'm glad you de-lurked! Not nabbing a bottle of Après l'ondée extrait before it disappeared (I was too broke at the time) will be a life-long regret... Now I'll have to seek out Casmir! It's true, I was reflecting on that myself... Mind you, I'm sure I missed out on a lot of things I didn't connect with fast enough, that got lost in the onslaught of new samples. Somehow, I think that when you manage to "storytell" a fragrance, the words anchor it in memory more firmly. Well of course: Narcisse Noir was worn by Anaïs Nin, I seem to remember. And thank you for your kind words -- so glad that mine led to our meeting in the real world! Happy Birthday, and thank you for Grain de Musc. Your blog can light up the darkest of days. I have spent a fortune in the past six years-lots of Annick Goutal, Hermes, Creeds and Carons. Manoumalia would make my list too, and I am so glad to see the Patous included-They were two of my favorites this winter. That's so sweet of you to say, Carole. I'm so happy that my efforts make that little bit of a difference -- it's a great incentive to keep at it! Thank you dear! Venn diagrams are one of the few things I remember from math class, along with cross-multiplication (something that seems to be happening to my perfume bottles of their own accord, or perhaps it's the miracle of the wedding at Cana?). Raising glass back! Happy anniversary! Love your writing (both the blog and the book). I am still so early in my collecting that I do not own even 25 bottles worth keeping or naming as favourites. If I made a list there would have had to be more 70s and 80s scents listed (even if reformulated). I also would have listed fewer Chanels, I imagine. So many of the perfumes on your list are ones I have not tried, or only briefly, so your list may serve as inspiration to widen my taste in perfume. I can clearly see we are not scent twins, even if I spot some favourites of mine on the list! Séville à l' aube is lovely, and finally I own a full bottle, bought earlier this year. 25 is a wonderfully manageable number, and I'm happy Séville à l'aube is among them! Thank you for your kind words. Happy (belated) anniversary, D! It's wonderful you've been writing and posting so profoundly and consistently for 6 years. Not sure how you (and Robin K and Victoria F., etc.) keep up with it, it's exhausting for me to even think about. How clever of you to limit this to scents you have in full bottles! I'd be over my 50 if I added in, say, the Amouages and JAR Golcanda. A quick run-through of my collection and most-worn gives me Nicolai and Chanel tied for first, with Guerlain and Dior tied for second with five faves each. Frederic Malle makes no showing; that's surprising! No Cartiers for me either, and even fewer Lutens (!!) than you, but more Hermes and Rochas and the Holy Trinity of male Carons (in original versions) on my list. Also, I have two each of Donna Karan, Kenzo and Ormonde Jayne. As with your list, chypres lead the pack, with ten for me - at least if we apply a fairly loose definition of chypre - followed by lavenders/fougeres (hmm! 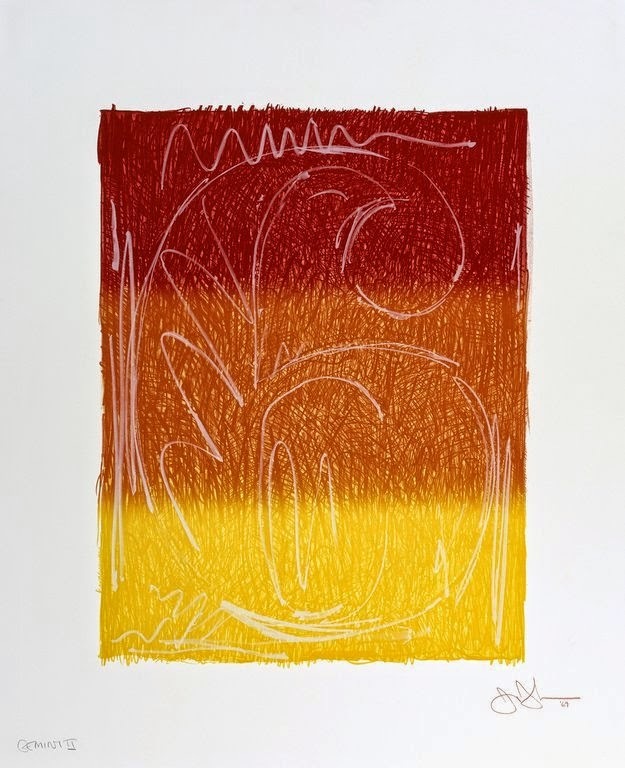 ), citrus and orientals. Only four white florals (but they are precious to me) and no real leathers at all. Thank you Erin! Not sure how Robin and Victoria do it either, they're much more consistent posters than I am! It's interesting to gauge one's own tastes by making those lists, isn't it? It often turns out we're pretty consistent in our personal "classics". That's why I tend to focus on new things for our seasonal top 10s, otherwise I'd repeat myself constantly. And clearly, chypres are dominant in many aficionado's lists: it's a connoisseur's genre (I say). Happy birthday, Graindemusc. What a lovely thing, to read your personal FB list, Denyse. You write so compellingly and thoughtfully about everything you review, but it's nice to see your personal favs! Thank you Jarvis. There are many more I enjoy or find beautiful, but those are the ones I'm most eager to get back to. But as a colleague whom I used to co-sign fashion reviews once told me, you can't judge something aesthetically based on whether you'd wear it or not. Hello, I am a fairly new reader but I have spent quite a few hours of my past week rereading your old posts and have thoroughly enjoyed them. Warm congratulations on 6 years of blogging! Great list, even though my tastes differ considerably (still unable to handle animalics...) Your post reminds me that I must go and try the newest version of Mitsouko extrait..! Happy Anniversary Carmen! Only 6 years and it seems you have been here for ages writing what is one of the must read blogs for me. I guess 6 years *is* a pretty old age for a blog. Funny, I never saw myself as a Chanel girl. And I usually think more in terms of perfumers' styles that I'm drawn to, though brand aesthetics certainly count for a lot in this particular creative field. I guess wanting to *wear* certain perfumes as opposed to appreciating their beauty is closer to a sartorial, or even culinary choice. I'm currently wearing "Séville à l'aube". I'm at peace with what I have at hand (my perfume library is 500km away). What with hesperedic frag these days? It had a new spray bottle! I coudn't resist. I score a bottle on ebay. Yi-haa! But it's Séville à l'aube (former "édition limitée" version) that I wear. One long lasting orange flower essence to indulge myself with. And the double hint-hint of vintage (lavender-salva) and masculinity (man cologne undertone) in it. Thank you Julien! Love your reading of Séville à l'aube. It was indeed conceived with a vintage vibe -- Bertrand's quote of old Spanisch fougère and the Habanita part of my story. Thanks for the wonderful journey! I've learned so much as you've prodded me along. I share many from your list. Thank *you* for your kind words, and bisou back! I loved reading your list and I've sent this post off to friends who complain that the "oldies" are gone forever and that there's not much out there today. I like how you've stuck to brands that aren't so difficult to find! Niche is great but if you can't get access, what's the point? I agree with almost all of them. This post could also have worked well around Thanksgiving Day! Way late but a very enthusiastic Bon Anniversaire! I have been so happy to read your blog and get to know you in person. I have way too many bottles and have never made a list of my top 50 but we have quite a few in common, including of course Séville à l'Aube. :-) See you in August! And I'm late in answering! Too many bottles is certainly an issue I can relate to. But there are worse problems, right? Love your list. We share quite some chypres - lovely genre. Thank you Angelika! They're definitely my favorite fragrance family! As a reader since year 1, thank you for persevering with your blog. I enjoy every opportunity to read your take on new fragrance releases, interviews, and erudite comments on the industry. I have been less active on the perfume blogs than I used to be, but I still make time to read yours, although it may take me a week or two. Catching up this week (on vacation- which helps!) I've updated my "to try" fragrance wishlist and just placed orders for a bunch of new samples. Wish Ouillet Bengale was available, as I ordered from Aedes, but I put it on my list for next time. Congratulations on six years! Hi Gail, and thank you! It *is* hard to keep up with all the offer, isn't it? And thank you for that windfall of a few years back, some of which made its way into my book, that was truly valuable. Loved looking at your list of favorites. It's grouped by house and general categories, yes, but it's still "big picture". Have I ever made lists. I was just commenting about this on boisdejasmin. I'm trying to keep away from lists lately because access to the Edwards database made me obsess over details. I was forgetting to just open the bottle, sniff and enjoy. I love peonies, do I have a peony perfume? (Dune, apparently, though I don't really get any peony in there.) Do I have something from each major brand or perfumer? (Not quite at about 30 bottles, and who cares if I have three Lutens and no l'Artisans; sorry not even yours!) I have a lot of woods, I need more orientals. And so on. And then the categories for when and why to wear my perfumes! Is Bois de Violette for spring or fall? Is Fleur de Cassie a good "Sunday scent"? If I'm just volunteering at preschool is it ridiculous to wear Iris Silver Mist? Ah, forget it, just wear what you feel like wearing that day and enjoy; otherwise your possessions are possessing you! Looking at my collection from a bird's eye view, rather than obsessing over the details, I like white florals and aldehydic florals, woods and chypres. That's still pretty general and could cover almost everything, but trying not to obsess over the details! You're right, getting too much into the "comprehensive collection" thing can draw us away from the reason why we got interested in fragrance in the first place... Usually gut feeling is a pretty good way of picking what feels good for a particular day!